For the past few months, I've been watching Blake's 7 for the first time. Now, for those of you who have never even heard of it (which wouldn't be surprising given how little attention it's ever been given here in the U.S.) it's a British sci-fi series that ran from 1978 to 1981. The series centered around the adventures of a small group of resistance fighters who pirated the most advanced ship in the galaxy, and used it in an ongoing attempt to bring down the totalitarian Terran Federation. I started watching it because it's come up repeatedly in my studies of fandom. Any time a British sci-fi enthusiast was interviewed Blake's 7 would almost invariably come up. It's reportedly influenced everything from Firefly to Battlestar Galactica to Aeon Flux. As of this evening, I'm two episodes in to the final season of the show. There are definitely some interesting bits and pieces throughout the series, and I certainly wouldn't call it bad, but I'm not really enjoying it. The first thought that might cross people's minds (especially those who have seen and enjoyed the show) is that I'm probably too spoiled on more recent science fiction shows with better effects and such. That I can't appreciate the show for what it was back when it first aired, and how original it was compared to 1978 standards. But that's okay. It's not a movie for everybody. Leave it for film buffs and old school science fiction fans. Time marches on in only one direction, and today more people want their blue CGI cat-people. A century from now, it'll look just as dated as Metropolis does now. Audiences will be interested in whatever the entertainment du jour is, however that best speaks to their lives. Which leads me to this question: why are we still seeing "Best of 2009" lists?!?!? See, Blake's 7 was reviewed when it first came out. Metropolis was reviewed when it first came out. The stories haven't changed. (Well... much. Some footage from Metropolis was lost.) Everything that was written about Blake's 7 and Metropolis is just as valid as it was at the time, right? They're rated on their own merits. It's not fair to compare Metropolis to, say Matrix -- they're completely different movies, made under completely different circumstances, for completely different reasons. Likewise, you can't compare Blake's 7 to the old Commando Cody serials. A little over a year ago, I noted how I thought "Best Of" lists were crap in the first place. But then to summarize those titles using an artificial and arbitrary designation of time? Yes, there is something to be said about art reflecting life and one could argue that all works of art made during the same time period reflect different aspects of the same time, but we're talking about at least a year and half span here. A book released in early January 2009 (thereby "qualifying" it for inclusion in a "Best of 2009" list) could easily have been worked on in August 2008. Which, I might point out, was before the world economy went to hell in a handbasket and before Barack Obama had actually won the Presidency. And to make matters worse, here we are, comfortably into 2010 (again, an artificial designation) but people are still yammering on about them! They're not even following their own arbitrary timeframes by dragging this crap out! Here's my point: review whatever books you like. Review them however you like. If it's a good book, it's a good book. When I see a promising book review, I make note of it when I see it. If I can't buy the book right away, it goes on a list of stuff I'm looking for. If it's a book that came out a couple of years ago, I'll still make note of it and track it down. Regardless of whether it made it to some silly "Best of" list. I tracked down Blake's 7 because of the individual reviews I'd seen. I don't know (or care) if it ever made it to any "Best sci-fi of 1978" list. It's valid on it's own terms. I do have some problems with it, myself, but that still doesn't invalidate what I'd previously read. Difference of opinions. I originally tracked down Metropolis for similar reasons and I know it didn't make any "Best of 1927" lists. Listen, if you MUST do a "best of" list, can you PLEASE confine it to the year you're doing it in? I'm sure you put a lot of effort into them, but they really are a terrible waste of time and I don't think we really need to be bothered with last year's business any longer. Time, as I noted earlier, only heads in one direction. How about looking forward, and not staring in the rear view mirror any longer? A glance or two behind you is fine, but you're going to run off the road if you spent so much time looking backwards. I love Blake's 7, first got to exposed to it via The Fortean Times. Surely this is ironic. Best of lists help us place a book in its contemporary context and evaluate it amongst its peers. Your own argument (that Metropolis should be assessed as the awesomest movie of its era) reinforces your point. Are years arbitrary units of time? Yes! Are they still meaningful? Of course! Are you just being contrarian. @Gallaher - My biggest problem with the series was Roj Blake himself. I can't tell if it's how the character was written or how he was played by Gareth Thomas, but I found him completely unconvincing as a leader that anyone would follow, much less strong characters like Jenna and Avon. @David - I think that "best of" lists claim to do what you say, but rarely, if ever, actually do precisely because the year designations are arbitrary. I'm not saying that books can't be reviewed in comparison to one another, just that the wholly arbitrary year distinctions are meaningless. We don't really think in those terms. "The 1970s" is thought of as some vague period starting around 1973/74 and running to about 1981. Likewise, depending on who you ask, 2009 could be easily thought of starting as early as September 2008 or as late as January 20, 2009. Comparing two books (movies, TV shows, whatever) to one another just because they happened to be released in the same calendar year is an exercise in futility because the events affecting comic book creation (at all levels) don't fall neatly on January 1. Compare it against something meaningful. Even something superficial like genre or the type of brushwork makes more sense than what year it was released. There's at least something to generate a reasonable comparison from there. Further, I think dwelling on the past is also futile. As I said, time only goes in one direction. Let's work on moving forwards. Yeah, there were some great books that came out in 2009. Been there, done that. What's 2010 got for us? 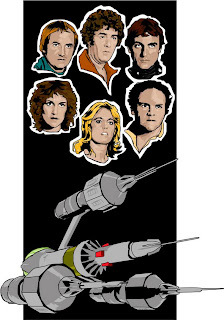 I watched Blake's Seven when it originally aired. It was a pile o' crap then and I'm pretty sure it won't have got any better since! I'm chiming in WAY late on this, but... I remember the show from its American broadcast on WTTW, and never found the stories compelling or the characters interesting. It was dull in the way that most British (and American) Sci-Fi TV was in those days (even the last season of Tom Baker's Dr. Who -- yep, I said it!). However, the final episode of the series -- and especially the final scene -- made a huge impression on my asocial geek brain, and I remember it to this day.